When it comes to sprucing up your outdoor decor, a great philosophy is to work with what you already have and then make some thoughtful additions. An outdoor living space is an important area of your home; between entertaining, lounging and family meals, you will find the space is quite often utilized and deserving of your attention. Don't feel limited or overwhelmed by the size of your space. You can enhance your backyard even on a budget with these helpful tips. Turn your outdoor space into an intimate setting for entertaining and personal use. Think of your area as a room without walls and decide how each piece works in relation to one another and your outdoor environment as a whole. The arrangement of your outdoor space should speak to your plans on using the area. Decide on a color palette to incorporate into your new outdoor decor scheme. Bright whites and neutral sand tones are perfect for an outdoor oasis because they contribute to an overall tranquil feeling. Nothing beats beautiful sunlight spilling over a fresh coat of white paint and your patio garden. A hammock is a simple way to update your backyard and make it feel more relaxing. They work in almost any setting; porch, terrace, patio or yard. A nap in a hammock can be a great end to your day; the easy swinging motion is calming. Hammocks are also a great decorative accessory. Lounging in your new outdoor space is top priority. In addition to a hammock, building or buying a cozy daybed for outdoor naps, reading and entertaining is a great idea. A swinging daybed is a fun middle-point between a hammock and outdoor sofa. Adding a fence can help create privacy from neighbors and boundaries from other areas of your home. Fences are great for both rural and urban outdoor spaces to give a sense of cozy quarters while entertaining. A simple idea that works for any size space is adding potted plants. You can never have enough green in your outdoor space. Grass is a given, so put a little thought into your landscape detail with hanging or potted plants. Lanterns are a playful addition to your backyard setting. The luminous home decor adds light and interest to your space. Things with function and form are our kind of home goods! Another idea is stringing pretty lights along a fence or post for extra lighting. Weather-resistant furniture can be ideal for dining alfresco. Since you will be dining outdoors, choose a solid base for your table and invest in coverings to protect the furniture. 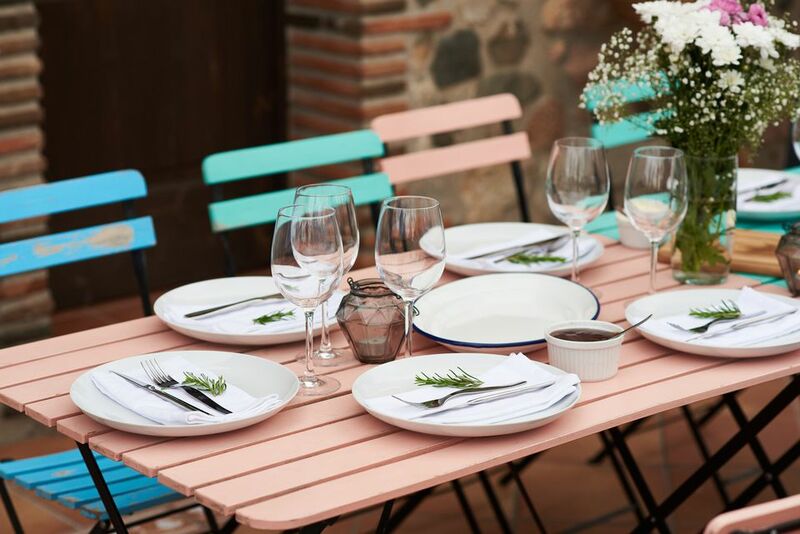 Make it a priority to eat outside at least once a week during the warm weather seasons, in addition to inviting friends over for special events. If you don't have the money or space to invest in an elaborate al fresco dining situation, create your own little outdoor breakfast nook. Sitting outside in the sunshine with your newspaper, fresh cup of coffee and bowl of fruit is a great way to start each day. Add floor pillows and poufs to your lounge area. This is an easy way to create extra seating and a Bohemian feel to your outdoor space. Floor pillows are perfect for both urban and country homes, potentially adding some style to your patio. Poufs also work as extra serving space. Escape your daily routine with an outdoor home away from home. Make sure your outdoor area is significantly spaced away from your actual home. Retreating into your patio oasis will be most enjoyable if it feels like it's a mini getaway from your day-to-day. Bench seating is effortless for outdoor dining. Benches also have a very outdoors-y feel for general seating in your backyard. They are simple, direct and beautifully crafted. It's fun to bring island style to your backyard. Whether you decide to incorporate a tropical plant or lounge cushions with a palm tree print, a tropical touch always leaves you feeling like you're on vacation and translates into relaxation for you and your guests. Nautical themes are so fun for outdoor entertaining. If you prefer to leave the island style for Mexico, another great option is playing with shades of blue for a seaside feel. Seashells, anchors, and boats all make great motifs for outdoor decor. Love the idea of adding textiles like rugs to an outdoor space. Just remember to check for inclement weather. Make sure all things that could be weathered make their way into storage. Wicker, bamboo, and rattan outdoor furniture all have a very light, summery feel and can look super chic in your backyard. Stick with a neutral rattan color for a traditional aesthetic, but white or black painted wicker and rattan furniture have a great modern look too. Whoever said outdoor dining or lounge chairs have to match? Mixing benches and chairs is a great way to save and collect amazing individual pieces. All seating can be different if you like. This is a great decorating option for vintage lovers. Often people tend to lean toward neutrals for outdoor decor, but that doesn't mean you need to shy away from pops of color. Mimic the sunshine and sky with bright yellows, oranges, and blues for a gorgeous addition to your outdoor landscape. Planting flowers is also a simple way to get color into the mix. When the sun is too hot to handle, have a cover-up available to pull overhead for shade. Invest in a tent, or curtains or a taut piece of canvas will do the trick.